August and September are going to be rather exciting months for me. With the novel releasing on August 1 highlighting all, I’ve also got a trip to Memphis to see Duran Duran in concert and a trip to Paris coming up after that. So much to look forward to this fall! The trip to Memphis to see Duran Duran has a story to it. The two women I’m attending with were my besties back in high school. And what brought us together? A band called Duran Duran (there, I’ve dated myself). And we were obsessed with Duran Duran. Unfortunately, we never got to see them live as the one show we were going to buy tickets to ended up getting canceled. Our closest city is Memphis (about 100 miles away) and it seems to have been a music wasteland even then. I’ve known musicians who have sworn they’ve only played Memphis once and will never play it again. For a city so steeped in musical history, it’s a darn shame. That being said, fast forward to 2012 and a tour announcement that Duran Duran will be playing at the Memphis Botanical Gardens. I was literally in shock as I’m pretty sure this is their first show ever in Memphis (yes, after ALL these years) and so bought tickets the day they were available for the three of us. We just all recently reunited, thanks to Facebook and by me moving back to Missouri. So going to the concert together is basically a full-circle event for us. Today, I indulged in the beauty that is William Shatner’s Priceline and got us a very discounted room at The Peabody Hotel. Now, Memphis isn’t known for swanky hotels, obviously. In fact, there are no 5-star hotels in Memphis and only two 4-star ones. The Peabody, however, has this local reputation as being rather swanky and judging from the lobby, it probably is. I’m sure it’s not the Four Seasons, but it is the most expensive hotel in the area. And they have ducks. 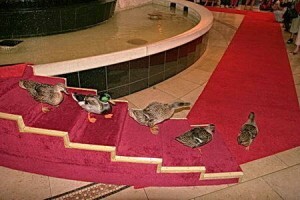 Ducks that march through the lobby every morning and every night to/from the fountain there. DUCKS! I have always wanted to stay there, though, and in my youth, when there were concerts in Memphis, this is where the rock stars stayed. So this is also a sort of dream for us. Finally, in September, there’s that little trip to Paris I’ve blogged about. This will be my third trip into the city and I’m excited to finally be able to visit and just relax. I’ve seen all the major sites, so I’m checking out some lesser known ones, though I do plan on returning to the Louvre (I hope I don’t regret it) and the Centre Pompidou (my favorite museum in the world). Of course, this week, I’m still wrapped up with the play I’m doing with The Bootheel Community Theatre. If you’re local, please come out and see us!